Looking for heavy photons; searching for dark matter; big laser. 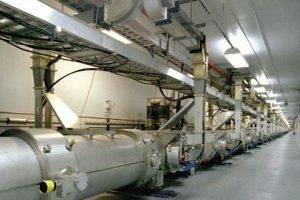 The SLAC National Accelerator Laboratory and others have embarked on a mission to find hypothetical particles called heavy photons. In 2015, researchers from the so-called Heavy Photon Search (HPS) group started the experiment at the U.S. Department of Energy’s Thomas Jefferson National Accelerator Facility. Researchers installed a particle detector half a millimeter away from a powerful electron beam within Jefferson Lab’s Continuous Electron Beam Accelerator Facility (CEBAF). Recently, researchers conducted the first tests with the system. The goal is to find “dark sector” particles like heavy photons. These theoretical sub-atomic particles could help unravel the mystery of the universe and perhaps provide a clue about the composition of the materials on earth. Dark sector particles fall in the category of dark matter. In theory, some 4.9% of the universe consists of observable matter, such as protons, neutrons and electrons. Then, some 68.3% of the universe is dark energy, while the remaining 26.8% is dark matter. An unknown form of energy, dark energy permeates outer space. In theory, dark matter exists in the universe, but it is invisible to the entire electromagnetic spectrum. Thus, researchers have failed to directly observe or detect dark matter. To find heavy photons, researchers used a continuous beam of electrons from Jefferson Lab’s CEBAF facility. In the lab, the electrons hit a tungsten target, which, in turn, could produce heavy photons. So far, though, researchers have not found dark or heavy photons in the first-run or early experiments. But the early results are promising, according to Mathew Graham of SLAC. “In addition to figuring out if we can actually do the experiment, the first run also helped us understand the background signals in the experiment and develop the data analysis tools we need for our search for dark photons,” he said. In a separate project, researchers from the XENON Collaboration have been looking for an elusive part of the makeup of the universe—dark matter. As stated above, dark matter exists in the universe. However, it is invisible to the electromagnetic spectrum. As a result, researchers have been unable to directly observe or detect dark matter. 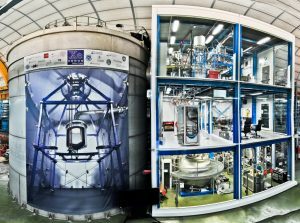 Recently, the XENON Collaboration, a group of researchers from several countries, has released the first results from a dark matter experiment. For this, the group developed a giant liquid xenon detector, dubbed the XENON1T. The detector is installed underground within the Laboratory Nazionali del Gran Sasso in central Italy. The 3.2-ton system is based on a dual-phase time projection chamber. The chamber resides in a mountain to shield the detector from cosmic rays. The chamber itself is situated within a cryostat in the middle of a water tank. The tank maintains the xenon at a temperature of -95°C. In the system, there is a particle interaction with the liquid xenon. This leads to tiny flashes of light. 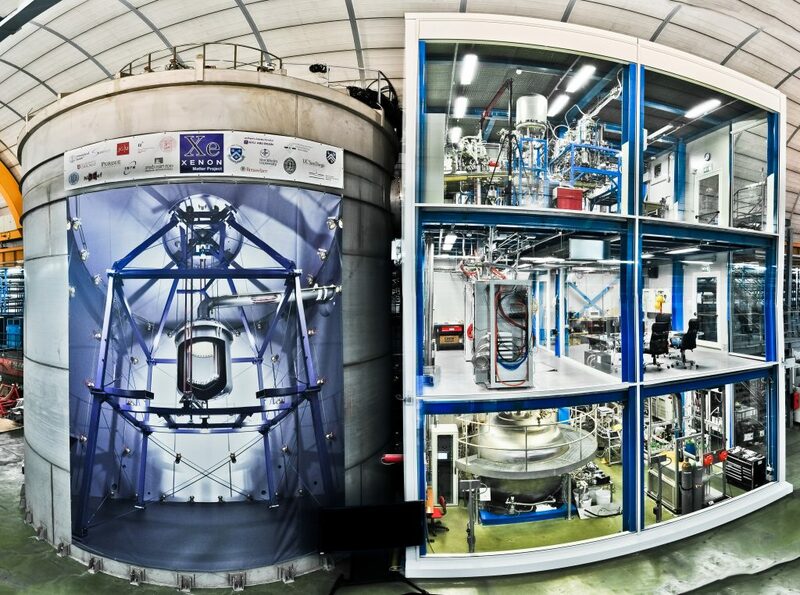 “A 62 kg liquid xenon target is operated as a dual phase (liquid/gas) time projection chamber to search for interactions of dark matter particles,” according to the XENON Collaboration. Following this step, researchers then examine the energy of the interacting particles. Then, they can determine whether it might be dark matter or not. The European XFEL–the world’s biggest X-ray laser–has reached the last major milestone before its grand opening in September. The 3.4 km long facility has generated its first X-ray laser light. The light has a wavelength of 0.8nm. The first laser had a repetition rate of one pulse per second, which will later increase to 27,000 per second. The European XFEL is located in the German federal states of Hamburg and Schleswig-Holstein. It comprises three large sites above ground and several underground tunnels. Using the X-ray flashes of the European XFEL, researchers will be able to map the atomic details of viruses, cells, materials and chemical reactions. The main reason we do not want to find them soon is because retirement is 35 years away.